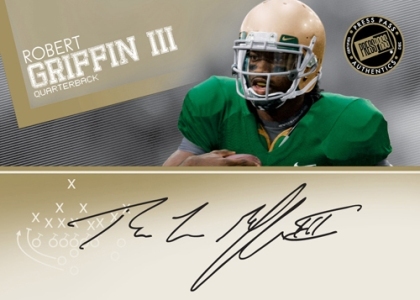 Getting a jump on the 2012 NFL season, 2012 Press Pass Rookie Football boasts the first autograph cards of top prospects Andrew Luck, Robert Griffin III, Trent Richardson and many more. In fact, the set has more 70 signers. Hobby boxes come with six autographs, featuring several designs and levels of rarity. 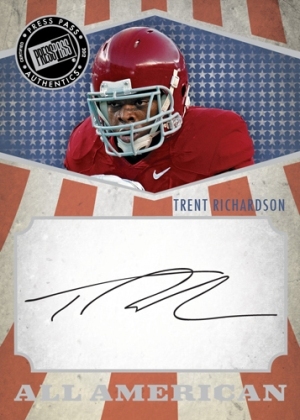 Collectors can also track down rare signed cards that are exclusive to Walmart and Target. 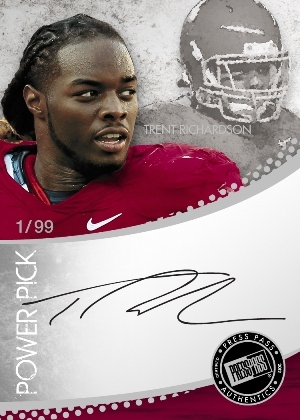 Besides the plentiful autographs, 2012 Press Pass Rookie Football has a 50-card base set and three parallel sets. 50 of the NFL's top prospects make up the 2012 Press Pass Rookie Football checklist. Base set parallels: Holofoil (#/299), Proof Edition (#/100), Solo (1/1, hobby-exclusive). Autographs fall 1:5 packs (six per hobby box). In total, more than 70 players have autographs in the set. Gold (#/199 or less) are defined by their horizontal X's and O's design. Bronze (#/99 or less) have a hash-mark design. Red (#/15 or less) are available only in Target packs and have a red player image. Green (#/15 or less) have a green image and are exclusive to Walmart. Only the top football prospects are included in Power Picks, which come in three levels. All American autographs honor the best in college football. Like Power Picks, these come in three rarity levels.